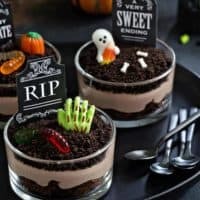 Brownie Dirt Pudding cups are a delicious Halloween dessert! Dress them up with graveyard decorations and serve them alongside a cold glass of chocolate milk for a spooky snack. This recipe is sponsored by The National Milk Life Campaign, but all thoughts are my own. Thank you for continuing to support the brands that make My Baking Addiction possible. It’s officially fall in Ohio and let me tell you, it came quick. I’m talking a 35 degree temperature drop over the course of 3 days. And I’m not one bit mad about it. I’ve been ready for sweater weather since about mid-August. Even though it was a ridiculous 85 degrees last week, I set out on an afternoon mission to pick up everything I needed to decorate our porch for fall. Complete with mums, cornstalks, heirloom pumpkins and pretty ribbon to tie it all together. I am not much of a Halloween decor person and never have been. I prefer the pretty stuff that I can display all the way to Thanksgiving. I mean let’s be real here, I’m the girl who walked through haunted houses with her eyes closed the entire time while clutched to the person ahead until I hit my mid-twenties. I fast-forward through scary movie trailer commercials because if not, I’ll have nightmares for no less than 3 days. My pretty fall decor has never been a problem for Elle until this year when our neighbors decided to creep out their house with glowing eye ghosts, witch legs shoved into bushes, faux headstones with bones, and creepy handprints on their garage windows. Literally the stuff my nightmares are made of. But Elle loves it. I decided I could give in just a little, so we picked up a flickering lightbulb for our light post and some adorably creepy ghosts. Then we headed to craft store to pick up all the toppings for these Brownie Dirt Pudding Cups. I don’t think it matters what age you are, kids young and old can appreciate Brownie Dirt Pudding. I mean, what’s not to love about brownies, pudding and crushed chocolate cookies? 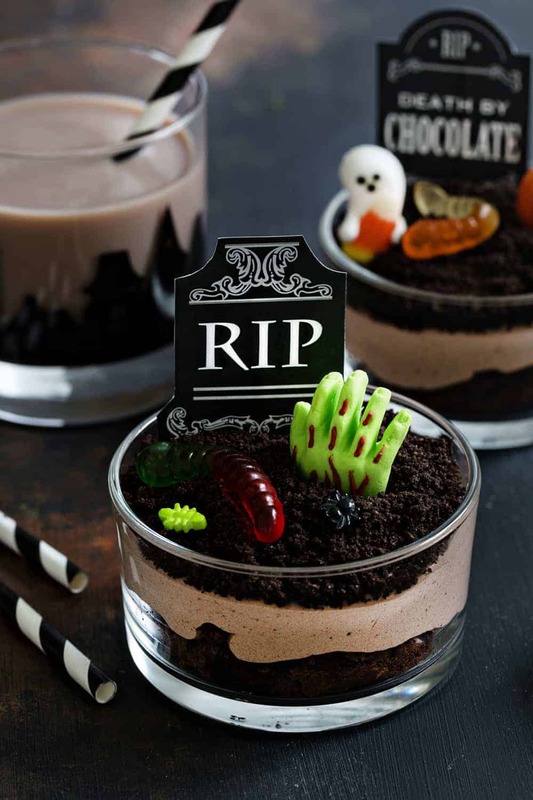 At Halloween, the youngest of kiddos will really enjoy making Brownie Dirt Pudding cups and decorating them up like little graveyards. To add this spooky spin, I like to reach for gummy worms, bone-shaped candies, paper headstones and cute candy ghosts, or creepy zombie hands. I also like to throw in a candy pumpkin or two, because you know my love for all things pumpkin runs deep. You might be able to find a precut version of the paper headstones at your local craft store, but if not, you can DIY it but using this free printable like I did. Just print them on card stock, cut them out, and affix them to a toothpick using a small piece of tape. Super simple and totally spooktacular! 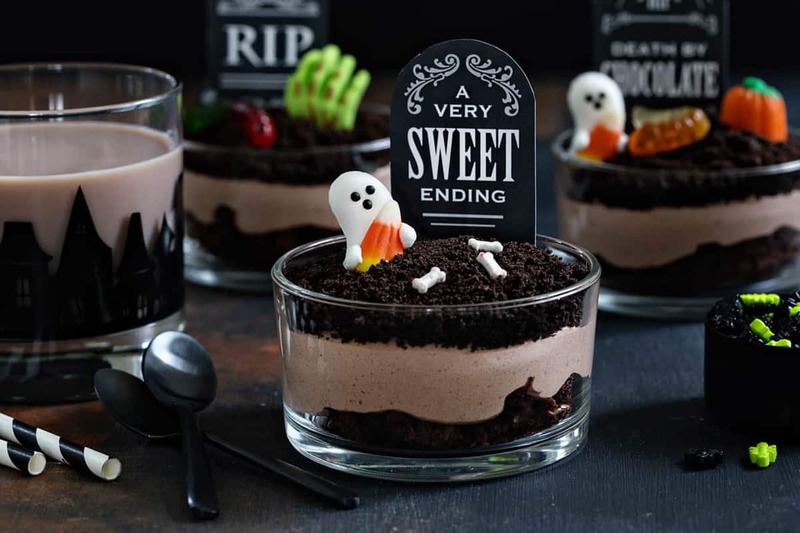 Even though Elle really enjoyed helping me decorate these Graveyard Brownie Dirt Pudding Cups, I have to admit that it brought out the kid in me, too. You know what else brings out the kid in me? Serving Brownie Dirt Pudding alongside an ice-cold glass of chocolate milk. After all, chocolate milk can really be considered the official drink of Halloween. And this time of year, I’m happy to give Elle a glass of chocolate milk with a spooky Halloween-themed snack because I know it has all the same essential nutrients she needs and gets from classic milk, with that special chocolate taste she loves. Did you know that the Dietary Guidelines for American recommend that kids should get between 2 and 3 cups of milk and milk products a day, depending on their age? Great news for anyone who loves chocolate milk: it has the same 9 essential nutrients in each 8-ounce glass as classic milk, including 8 grams of high-quality protein. 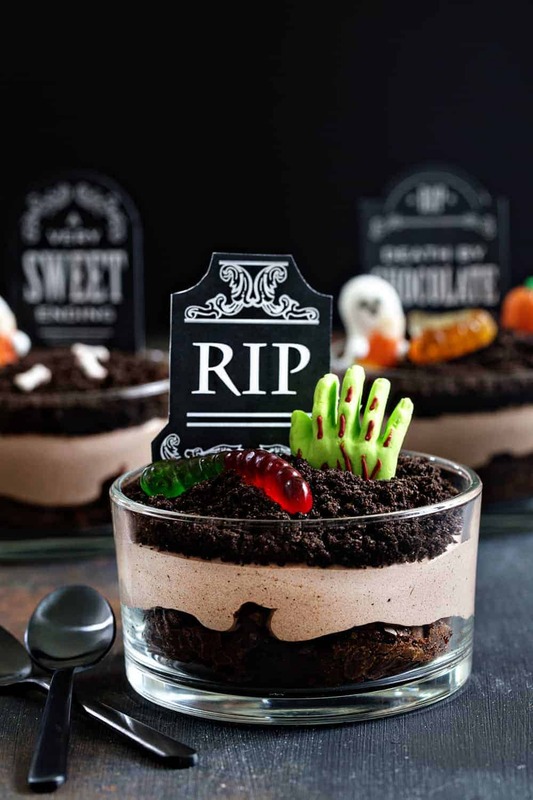 Even though Brownie Dirt Pudding looks adorable when it’s dressed up like a graveyard and will impress the heck out of any kid when it’s served alongside a glass of chocolate milk, it’s actually really easy to make. I know you don’t have tons of extra time to create elaborate Halloween treats, we’re in this busy season together! Brownie Dirt Pudding starts with a brownie base. You can use your favorite brownie recipe if you like, but these dirt pudding cups will taste just as good if you start with a boxed mix. Pinky swear! Our next layer is chocolate pudding mixed with milk, sweetened condensed milk and whipped topping. That gets topped with crushed chocolate sandwich cookies, or extra brownie crumbs if you haven’t eaten them all already. See, I told ya it was easy! Decorate ‘em up and pour a glass of chocolate milk in your favorite Halloween glass. This is one spooky Halloween treat your kids will love and you’ll enjoy sneaking bites of as well. Visit AmazonFresh to get chocolate milk delivered today to serve alongside your Brownie Dirt Pudding and round out this terrifyingly tasty snack! 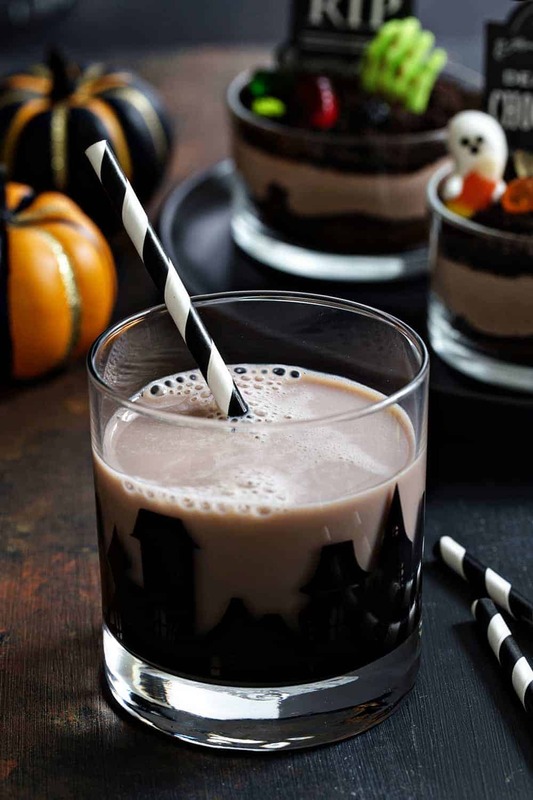 Looking for more Halloween-themed treats to serve alongside chocolate milk at your Halloween party this year? Check out my Halloween Chocolate Chip Cookies, Halloween Monster Cookies, Halloween Marshmallow Pops and these Dirt Pudding Cupcakes. For more tasty and nutritious milk content and recipes, visit PourMoreMilk.com or MilkLife.com and follow Milk Life on social media. 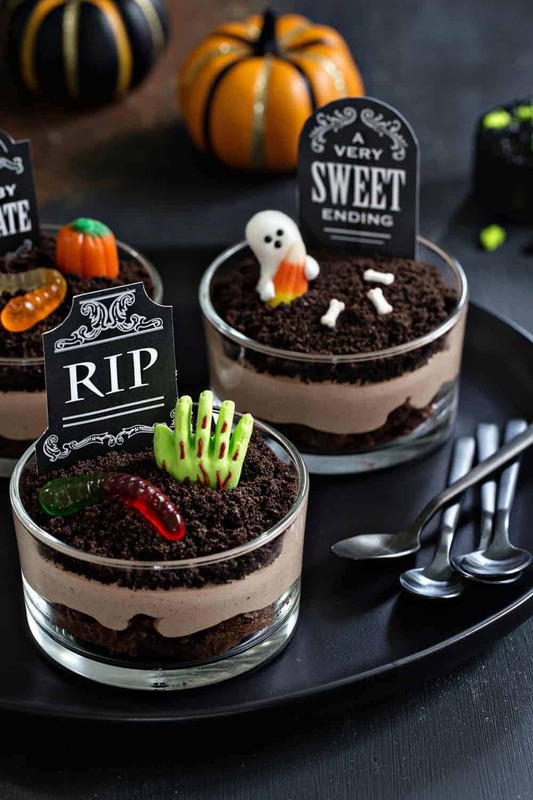 Brownie Dirt Pudding cups are a delicious Halloween dessert! Dress them up with graveyard decorations and serve them alongside a cold glass of milk for a spooky snack. Use a small glass or round biscuit cutter to cut the brownies into 5-6 circular shapes. The size will depend on the type of serving dish you are using. You want the brownie to fit snuggly into the bottom of your serving dish. Once you have the brownie circles, slice each brownie in half horizontally, directly through the centers of the brownies, so each brownie is now two thinner circular brownies. Place one brownie circle into the bottom of each serving dish. In a large bowl, whisk together the dry pudding mix, milk, and sweetened condensed milk until smooth. Fold in whipped topping and gently mix until no streaks remain. Evenly spoon or pipe the pudding mixture directly onto each brownie slice. Top with crushed cookie crumbs and decorate as you wish. This looks so good! Perfect for Halloween! Thanks so much for stopping by, Natalie! Aren’t they fun? I appreciate you taking the time to comment. Happy Baking! These are as much fun to make as they are to eat! Most definitely! They were a huge hit over here! Thanks so much for stopping by! can I ask where you got the candies you used (particularly the ghost hugging the candy corn and the hard candy monster body parts)? Hello! I picked them up at Michael’s. I was actually just there today and they still had them and now they’re 50% off! I hope this helps! My kids go crazy for brownie dirt pudding and it’s such an easy dessert! Milk is the #1 drink for my kids even the grown ones. I buy milk 2 gallons at a time and it’s a for real crisis if we run out! Ha! Sounds like my house. My husband freaks if we don’t have at least one gallon as backup! Thanks for stopping by! Such a cute idea! Can’t wait to try this with the kids as a fun family project. Thanks so much, Lisa! I hope you love it as much as we did! 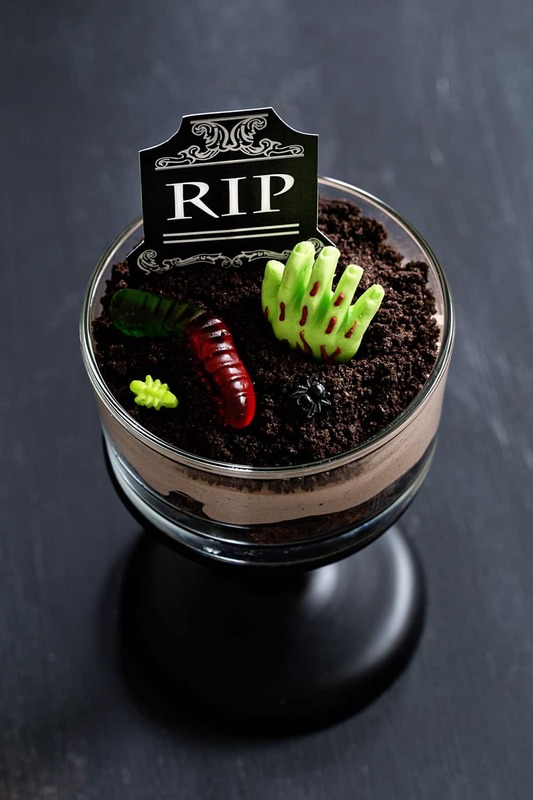 This is such a cute Halloween desert recipe! Love the layers of brownie and pudding. Yum! Thank you so much! It’s so easy and so darn delicious!